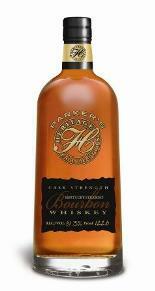 First release of "Parker's Heritage Collection" to be cask-strength Bourbon available in limited quantities. BARDSTOWN, KY --Heaven Hill Distilleries, Inc., the country's largest independent family-owned spirits producer and marketer, announces the release of the first edition of Parker's Heritage Collection, a limited annual series of rare, aged American Whiskeys that pays tribute to 6th Generation Master Distiller Parker Beam . Heaven Hill is the world's second-largest holder of aging American Whiskey with over 700,000 barrels, including many world-renowned brands rich in the history and heritage of the American Whiskey industry. Over the course of several years the company plans to release a select number of that inventory representing the full span of American Whiskey styles. Over time, this will represent the industry's broadest release of unique American Whiskeys with subtely varying taste profiles for varying consumer palates. Master Distiller and industry legend Parker Beam has been seeking out and sampling the finest barrels in his favorite locations from among Heaven Hill's 49 rickhouses. Now, after much time spent finding the right whiskeys at the right ages and proof strengths, Heaven Hill is ready to delight legions of whiskey connoisseurs with the first release of Parker's Heritage Collection. This series will tempt the growing number of Straight American Whiskey enthusiasts with something that only Heaven Hill could offer--a chance to sample these choice barrels that represent every major style of American Whiskey. As the only remaining national distiller that produces Bourbon, Rye, Corn and Wheat Whiskeys (Tennessee Whiskey being the remaining straight whiskey type, which must be law be made in Tennessee), Heaven Hill has in its inventory more whiskey styles/types than any other producer, barrels that would typically be dumped for acclaimed brands like Evan Williams and Elijah Craig Bourbon, Rittenhouse and Pikesville Ryes, Mellow Corn Corn Whiskey and Bernheim Original Wheat Whiskey. Parker Beam, who oversees all aspects of whiskey production at Heaven Hill alongside his son Craig, much as Parker did with his father Earl, has earmarked select barrels of each of these styles to be used for future editions of Parker's Heritage Collection, and has also selected 68 barrels of very special Bourbon for the first edition. "The barrels I have selected for this series represent some of the finest and most diverse whiskeys I have produced in my 45 years as a Master Distiller," said Parker Beam. "I think they will pique the interest of many of today's whiskey aficionados." This first edition, will be a cask-strength 1996 Bourbon that has mellowed over 48 Kentucky seasons on the fifth floor of Rickhouse Y in Bardstown. The bottling was drawn from a lot of 68 carefully selected barrels, which were dumped in three "very small batches" of 22, 22 and 24 barrels each. The Bourbon is then bottled at barrel-proof, marking the first time that Heaven Hill has released a barrel-proof Bourbon in the US . This cask-strength whiskey will only fill about 6,400 750ml bottles, and the proofs of the three batches range from 122.6 to 130.9--all a result of the evaporative process from the aging barrels known in industry parlance as "angel's share". Parker Beam , who is a charter member of the Kentucky Bourbon Hall of Fame and a Lifetime Achievement Award winner, personally selected these barrels for their superb nose, robust flavor and long, smooth finish. The packaging will reflect the sophistication and continuity of the series--each edition of the series will come in the same dramatic, stylish bottle, but each will carry a special version of the label identifying the type of American Whiskey, along with the necessary age and proof information. This new series represents a real boon for lovers of American Whiskey--and a well-deserved tribute to Parker Beam ," noted Heaven Hill president Max L. Shapira. "Today's American Whiskey connoisseur is not only seeking out the finest Small Batch and Single Barrel Bourbons, but is also excitedly seeking out other styles of straight whiskey. Rye , including our Rittenhouse and Pikesville brands, has been the most obvious beneficiary of this cross-style interest, but we have also seen great results with our unique Bernheim Original Wheat Whiskey, as well as renewed interest in our corn whiskeys such as the Bottled-In-Bond Mellow Corn label. We thought the concept of combining offerings of different American Straight Whiskeys, all under the umbrella of Parker's Heritage Collection, was an idea whose time has come.